At Herbal Republic we like to say that through tea, it is possible to capture the profound beauty of the natural world around us. Just as an artist aims to capture the beauty around him through his paints and brushes, we do so through the meticulous blending of fresh tea and herbs. Our latest creation, the Sun City Rooibos combines only the freshest and highest quality ingredients to capture the flavour and brightness of the tropical sun. Blended in-house from the finest rooibos, citrus peels, and orange blossoms, we ensure that every ingredient is as fresh as possible by sourcing directly from the growers. When the ingredients are received, they are blended by our master blenders and sold in small batches to guarantee that each customer is receiving a tea that can stand up to even the strictest measure of quality and freshness. For further assurance that our customers are being sold tea of only the highest quality, when we source our ingredients from the growers, if anything falls below our high standards for excellence, we do not use it in our blends. Sun City Rooibos has the natural creaminess and nuttiness associated with fine Rooibos but with top notes of citrus and light acidity reminiscent of vacations to the tropics. The smooth body paired with the sharp and sweet citrus creates an overall perfectly balanced blend perfect for sipping on a hot summer evening or over ice at an afternoon barbecue. One of the benefits of rooibos being the base ingredient of this blend is that it is extremely resilient against over brewing. Many teas, if left steeping over the recommended time limits can become bitter and unpleasant due to the tannins being released from the leaves. Rooibos is not affected by this however and is renowned all over the world for its tendency not to go bitter even after steeping for hours. 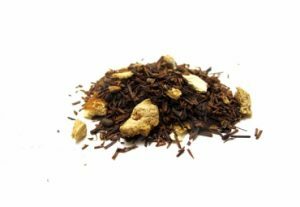 Because Rooibos is the tea’s base, this blend is ideal for the more forgetful tea drinkers out there who leave teas steeping for over the time recommendations. It is also great for hosts and hostesses that may be too busy to pay proper mind to brew times and who want to give their guests a great and engaging tea to drink at summer get-togethers. To buy Sun City Rooibos and experience a great summer loose leaf tea, click here.